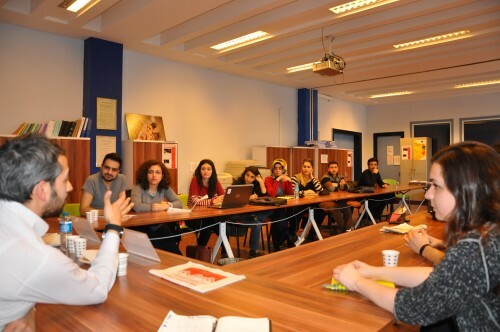 At the event on 26 March Thursday, experienced reporters from AA English News told students about basic significant differences while translating the news from Turkish into English. Burcu Arık said that giving reference while writing news is a necessity and background of the incident should be placed in news. She gave examples of structural features in news. Saying that news without 5W1H are rejected by editors, Tuncay Kayaoğlu said “You write the news according to institution you work for.” Kayaoğlu said that writing English News includes more than 5W1H and writing in a simple language is much more important in English News. Arık said that quotes form the huge part of Turkish news but highlighting important points of the quotes forms English news. She said that adjectives are used neither to underestimate nor to lower the person or institution but to add dimension to the news and they avoid subjective judgements while writing news. Emphasizing that news are consumed daily, Arık said that “News stale most easily.” Saying that editors look for real life stories, Kayaoğlu said “Cultural differences between source language and target language should be taken into account.” Saying that news of AA is considered as archives therefore details are important, Arık explained that age, place of living, physical appearance of the person in news should be given.